Amite City Town Hall is located at 212 East Oak Street, Amite, LA 70422; phone: 985-748-8761. Photo: Blythewood, ca. 1885, 205 Elm Street, Amite City, LA. Listed on the National Register of Historic Places in 1982. Photographed by User:Z28scrambler (own work), 2005, [cc-by-3.0 (creativecommons.org/licenses/by/3.0)], via Wikimedia Commons, accessed January, 2014. Like many towns throughout Louisiana, Amite owes its existence to the railroad. It and other towns in Tangipahoa Parish came into being as a result of the New Orleans, Jackson and Great Northern Railroad being built through the area in the mid-1850s. Amite's earliest settlers appear to have arrived in the 1830s; however, there was no town there at that time. As the survey for the rail line was being done, enterprising individuals in the area bought a large tract of land where a stop was planned. A town was laid out in 1860, and in 1861 it was incorporated as Amite City. In 1869 the new community became the seat of Tangipahoa Parish, created in that year. The town of 910 persons in 1870 grew steadily through the years, reaching a population of 1,677 in 1910 and 2,499 by 1940. The railroad town of Amite City quite naturally emerged as a center for goods and services for its own citizens as well as the surrounding area, where cotton and strawberries were the main crops for most of the historic period. By mid-century, dairy farming had become a major activity. The town's principal industry was the Gullet Gin Company, which manufactured cotton gins at a large plant about a mile south of the downtown. During the historic period Amite had the largest CBD between Hammond to the south and the Mississippi state line to the north, a distance of about forty miles. Also, although not the largest town in the parish, Amite was the seat of government, which undoubtedly enhanced commercial activity in the downtown. 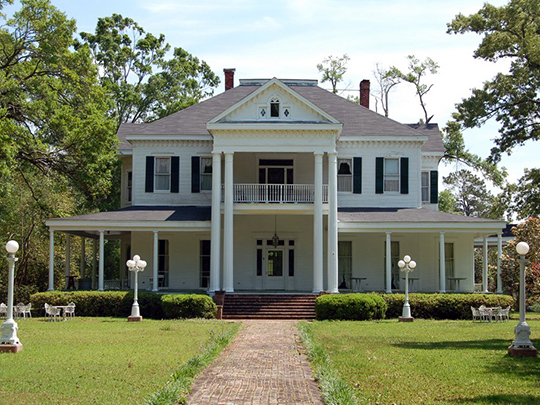 Louisiana National Register of Historic Places, Downtown Amite Historic District, listed on the Register in 1998, www.crt.state.la.us, accessed January, 2014.